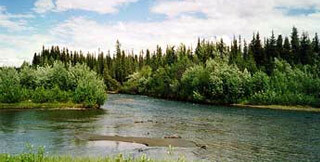 The Copper River Basin offers a creel full of opportunities whether it is on a river or lake, road accessible or remote. The Copper Basin, which includes the Wrangell-St.Elias National Park and Preserve, is located in Southcentral Alaska; 189 miles northeast of Anchorage, 250 miles south of Fairbanks, 115 miles north of Valdez, and approximately 200 miles from the Canadian Border on the Alaska Highway. The Copper River Basin is accessed by two major highways, the Richardson (Rt.4) and the Glenn (Rt.1). Four of the state's highways (Glenn, Richardson, Edgerton and Denali), together with numerous secondary roads and trails, provide good access to most of the areas sport fisheries. Float-equipped aircraft are commonly used during the summer to access the area's many remote lakes and stream fisheries not accessible by the road system. Snow machines are the popular mode of travel to remote fisheries in the winter. Principle land managers in the Upper Copper/Upper Susitina Sport Fish Management Area (UCUSMA) are the National Park Service (Wrangell-St. Elias National Park), the Bureau of Land Management (Gulkana Wild & Scenic River), Ahtna Incorporated (the local Native Corporation) and the Alaska Department of Natural Resources. The UCUSMA consists of all waters and drainages of the Copper River upstream from a line crossing the Copper River between the south bank of the mouth of Haley Creek and the south bank of the mouth of Canyon Creek in Wood Canyon, and all waters and drainages of the Upper Susitina River upstream from the confluence of the Oshetna River. Located within the UCUSMA are the communities of Glennallen, Nelchina, Gulkana, Gakona, Chitina, McCarthy, Kenny Lake, Copper Center, Paxson, Sourdough, Mentasta, Slana and Chistochina. Information regarding businesses and activities in the Copper River Basin can be obtained from the Greater Copper Valley Chamber of Commerce at (907) 822-5555. The UCUSMA offers a unique blend of freshwater fishing opportunities to sport anglers and subsistence participants. Three species of North Pacific salmon (Chinook Oncorhynchus tshawytscha, coho O.kisutch and sockeye O.nerka) are available to anglers fishing upper Copper River drainage waters. A resident-only, personal use dipnet fishery and a subsistence fishery takes place in the mainstem Copper River. The upper Susitina River drainage has no anadromous salmon upstream of the confluence with the Oshetna River. A velocity barrier in Devil's Canyon inhibits upstream migration in the Susitina River for most anadromous species. Anglers can also target coho salmon stocked in several landlocked lakes of the region. Popular fisheries also occur on the area's resident stocks of Arctic grayling Thymallus arcticus, Burbot Lota lota, Dolly Varden Salvelinus malma, rainbow and steelhead trout O. mykiss and lake trout Salvelinus namaycush. Smaller fisheries occur on the area's resident stocks of whitefish Coregonus and Prosopium spp. Currently twenty-nine lakes in the UCUSMA are stocked with Arctic grayling, rainbow trout, coho salmon and Arctic char Salvelinus alpinus. The stocked fish are reared at state-owned hatcheries on Fort Richardson and Elmendorf Air Force Base in Anchorage.